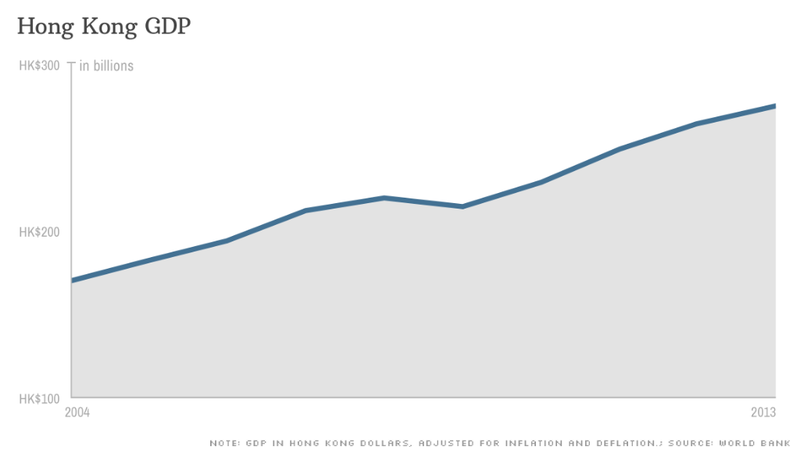 Hong Kong's ongoing pro-democracy protests are also driven by worries over income inequality. Hong Kong is a gorgeous city: shining skyscrapers, deep blue waters and towering green mountains. But behind all that rumbles a growing frustration with income inequality and crazy high real estate prices. 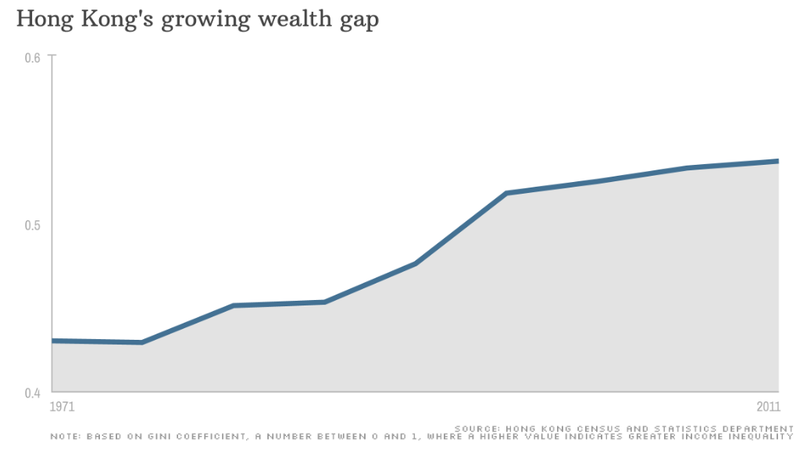 The gap between the rich and poor in the city is among the widest in the world, and the problem is only getting worse. Complaints over income inequality have bubbled to the surface during the pro-democracy "Occupy" protests, a movement dominated by students who worry they may not be able to afford a home or support a family. The city has a sky-high Gini coefficient -- a measure in which zero means perfect income equality and 1.0 means one fat cat takes home everything. Hong Kong scores a 0.537, well ahead of the U.S. at 0.41. Although raising Hong Kong's minimum wages from HK$28 per hour ($3.61) to HK$30 ($3.87) in May was one step in the right direction, more still needs to be done, said Paul Yip, a professor at Hong Kong University. The city has only had a minimum wage since 2011, and it's only been raised once. Even though income taxes are very low compared to the U.S., minimum wage earners still only end up with around $600 a month. 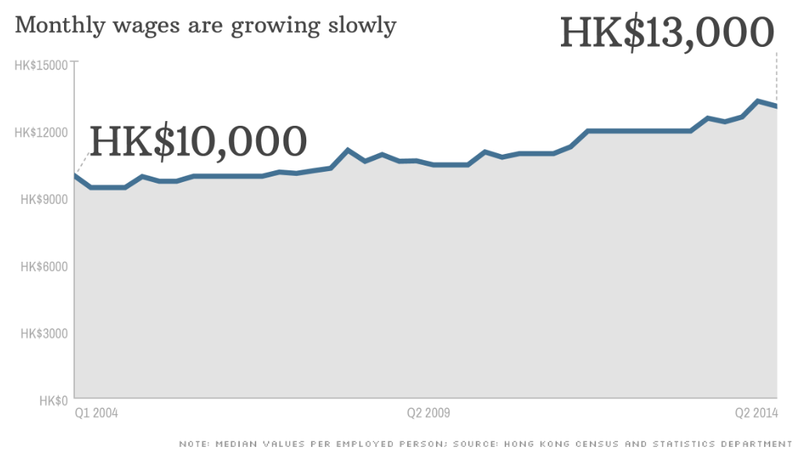 Overall, monthly median earnings have only increased by 30% over the last 10 years, while Hong Kong's GDP has jumped 60%. Although the city's economy has grown, such "economic improvement doesn't benefit the majority of the people," Yip said. For those in the 16 to 24 crowd, monthly median wages haven't budged an inch since 2001, and are still hovering at HK$8,000 ($1,031), said Chung Kim-wah, director of Hong Kong Polytechnic University's Centre for Social Policy Studies. At the pro-democracy protests -- where student-led groups are calling for free elections -- complaints over housing costs are frequent. "We cannot afford [an apartment], we could not have a shelter [even though] we work all the time," said protester Kaley Lau, 25, who works as a nurse. 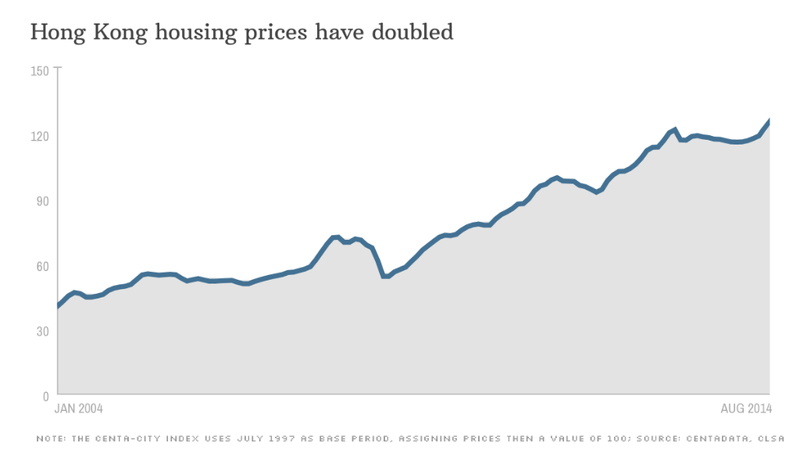 In fact, housing prices have more than doubled over the last decade, according to CLSA. Buying an apartment on Hong Kong island of less than 400 square feet now costs on average HK$5.23 million ($675,000), and average monthly rent for a place that size is HK$16,560 ($2,136). Homes on the outskirts of the city aren't much cheaper -- places under 400 square feet in the New Territories still average HK$3.68 million ($476,000). Owning or renting takes a big chunk out of your paycheck, meaning far less disposable income and lower quality of life, Yip said. And low-income earners who qualify for public housing still have to wait for up to seven years before getting an apartment, he said. The property sector is dominated by tycoons, who also control a number of other industries from supermarkets to utilities. Three companies account for 72% of the residential property market in Hong Kong -- without greater market competition, the tycoons are seen as gaming an unfair system in their favor. 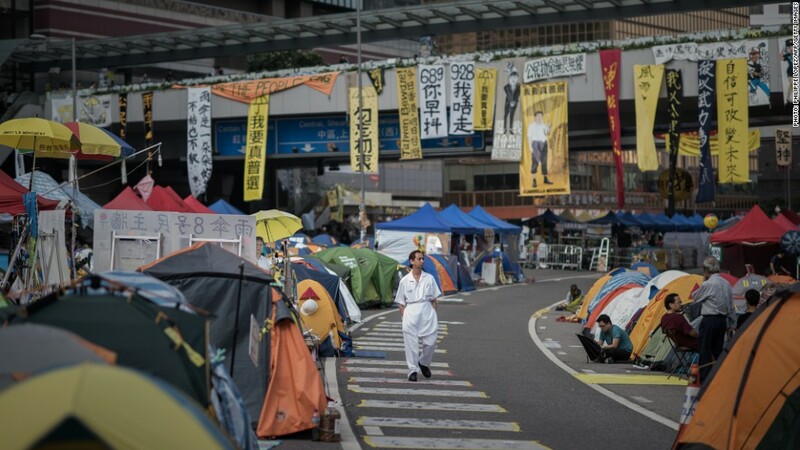 "Hong Kong people are frustrated because there is a structural inequality," Yip said. "These housing developers bid for land ... and make [property] so unaffordable for the people."